January Term 2019 at Trinity College offered eight focused on-campus courses as well as four courses taught abroad. J-Term provides students with the chance to study a specific and unique topic in between the fall and spring semesters. Associate Director of Intersessions and Special Assistant for Strategic Initiatives Dania Field said, “J-Term is a great opportunity for students to earn half of a credit while engaging in focused academic work for two weeks during their winter break. Experimental topics, offered by passionate instructors, enhance the overall experience.” A total of 120 students enrolled in J-Term courses this year. The nutrition course taught students about different facets of nutrition ranging from popular diet plans to the science behind food. Burke Giordano ’21 took the course as a way to create a better diet for himself. “I really wanted to learn more about nutrition as I tend to eat really unhealthy foods,” Giordano said. Throughout the two weeks, students logged their meals and learned about different types of foods, with the goal of designing their own diet plan based on their personal needs. 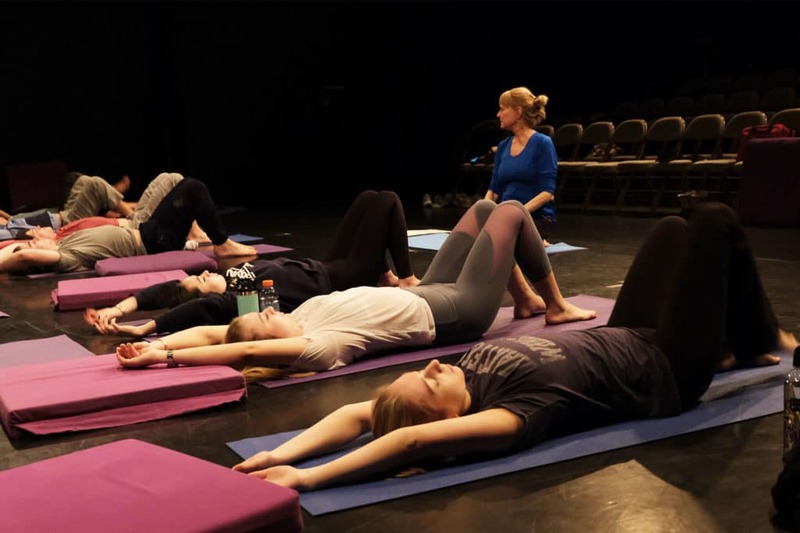 Students enrolled in Associate Professor of Theater and Dance Lesley Farlow’s ‘Yoga: Practice and Philosophy’ course during J-Term. Students also had the opportunity to enroll in Associate Professor of Theater and Dance Lesley Farlow’s “Yoga: Practice and Philosophy.” Farlow was excited that the three-hour classes allowed time for the students to not only practice yoga and meditation, but also to learn more about its underlying philosophy. “My goal for this course is for students to find their way in to a yoga and meditation practice that works for them. Ultimately, each student will try designing their own practice,” Farlow said. Megan Mika ’21 decided to take advantage of the long winter break and take a J-Term course to explore a topic in which she was interested. “I really like the yoga class because it’s a great start to my day and teaches me about meditation as well as physical and emotional care,” Mika said. Annie Lyman ’20 similarly took the course in order to learn more about a passion. “I do yoga a lot at home, and I wanted to take a class to learn more about the meaning of every pose and about its history,” Lyman said. The ‘Urban Swahili Coast’ group pictured in front of the Revolutionary Government of Zanzibar’s Commission for Lands: (left-right, front-back) Dr. Makame Muhajir, co-instructor; Said Ufuzo, Acting Director of Urban Planning; Sheha Mjaja Juma, Director, Zanzibar Environmental Management Agency; Paul E. Raether Distinguished Professor of Urban International Studies Garth Myers, co-instructor; Mohamed Habib, Landuse Planning Officer; Tianshu (Alex) Chu ’22; Sally Kyale (Smith College ’19); Esther Appiah ’21; Felicia McDevitt ’21; Anita Too (Smith College ’19); Caroline Munn ’21; and Ali Odermann ’21. Sonia Cardenas, vice president for strategic initiatives & innovation and dean of academic affairs, said, “We’re so pleased to be offering a few new courses this year, in addition to popular repeat J-Term courses.” The new slate includes study-away options, such as Paul E. Raether Distinguished Professor of Urban International Studies Garth Myers’ new course in Tanzania—“Urban Swahili Coast.” The course is co-taught by Myers and Dr. Makame Muhajir, former director of urban planning in Zanzibar. 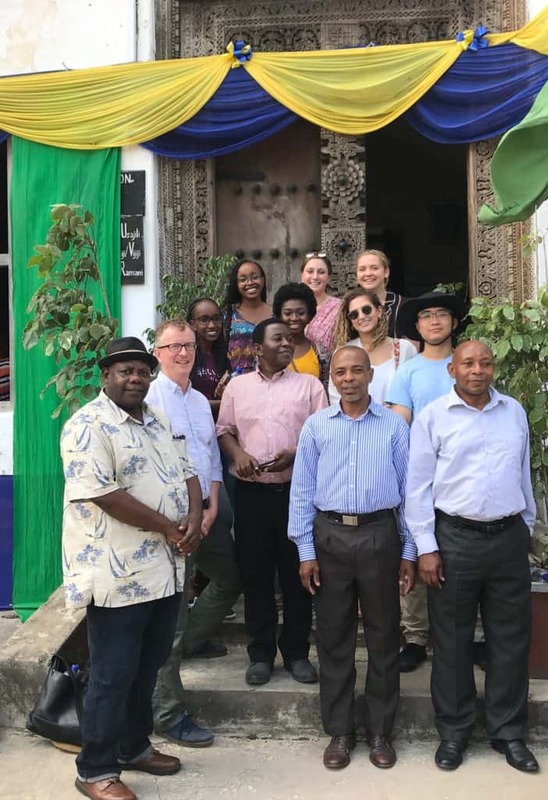 A group of five Trinity students and two Smith College students learned about topics including environmental issues, the history of the Zanzibar region, and urban planning and policy in a classroom setting, followed by afternoon site visits. Some of the field studies have included the Urban Service Project’s drainage construction sites, the 1964 Zanzibar Revolution Museum & Memorial, and the remains of the Migombani Botanic Garden. The wide range of topics covered in the J-Term courses this year included the study of Ancient Athens and instructions in flying drones, among many others.